Wow! So, I apologize for the few days I took off. I was in Phoenix at the Spellbinders Design Team Retreat and it was AMAZEBALLS, you guys. For reals. I can't even BEGIN to tell you just how amazing this trip was! I am so inspired to start creating!!! I know several of you have been waiting for me to announce some winners! I have two to announce, so let's get right to it! The winner of the Winnie and Walter $30 Gift Certificate is.... DEEPTI! Congratulations, Deepti! I will pass your name and email address on to Winnie & Walter so they can send you your prize! The winner of the copy of Gossamer Ghost by Laura Childs is.... Kelly Latevola! Congratulations, Kelly! I will be emailing you for your mailing address so I can send this out to you! Whew! That was fun! Now onto another card that was inspired by the Online Card Classes Holiday Card Workshop. One lesson focused entirely on one layer cards. This is generally a weakness of mine. While I do CAS, I usually have some layering of some kind on my cards, so I was excited to take this challenge. I loved the partial die cutting that Jennifer showcased, so I went ahead and tried it for this fun card! I used a Spellbinders® circle die along with a great matching stamp and die from Avery Elle to create my window. I inked inside the window and then heat embossed the sentiment. 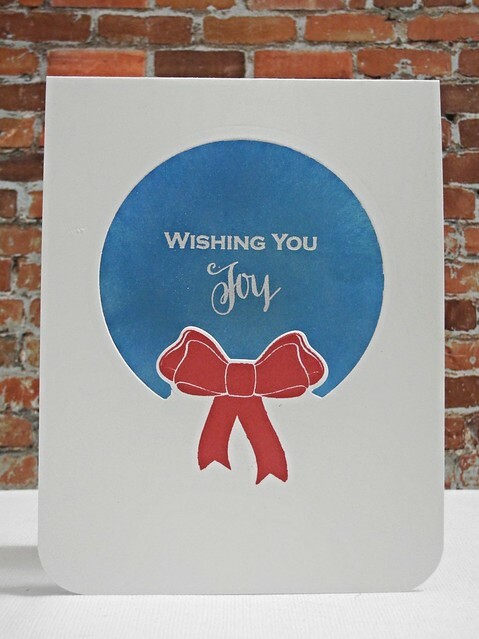 I used a scalloped circle die from Spellbinders to create a mask to do the inking on the inside of the card. I love how this adds just a touch more style to the inside. I am kind of loving this whole partial die cutting thing, so... I am fairly certain you will be seeing more of it around here. Because it's awesome. For reals, though. Welcome back! Glad to hear you had fun at the Spellbinders DT Retreat! Your card is just lovely! The partial die-cutting and blue backdrop is gorgeous!